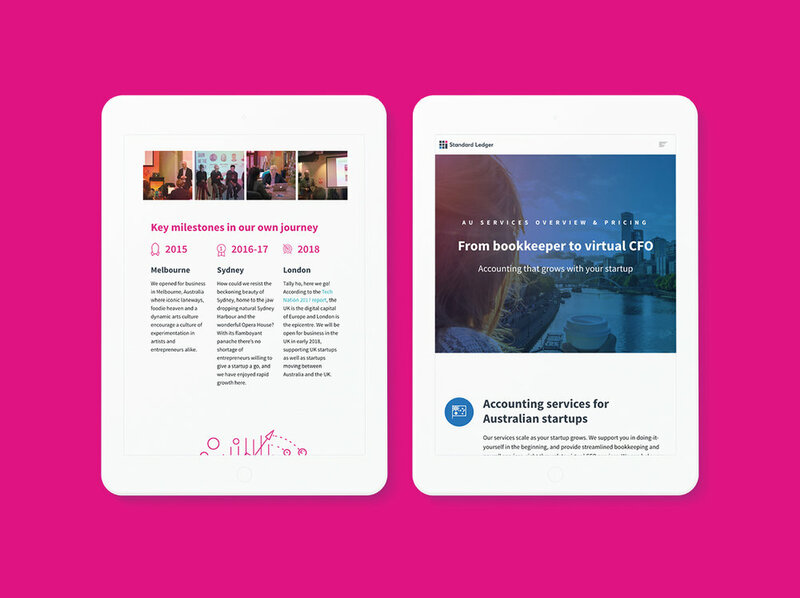 Standard Ledger, an accountancy practice specialising in startups, refreshed its brand with a view to expanding its Australian business into the UK. 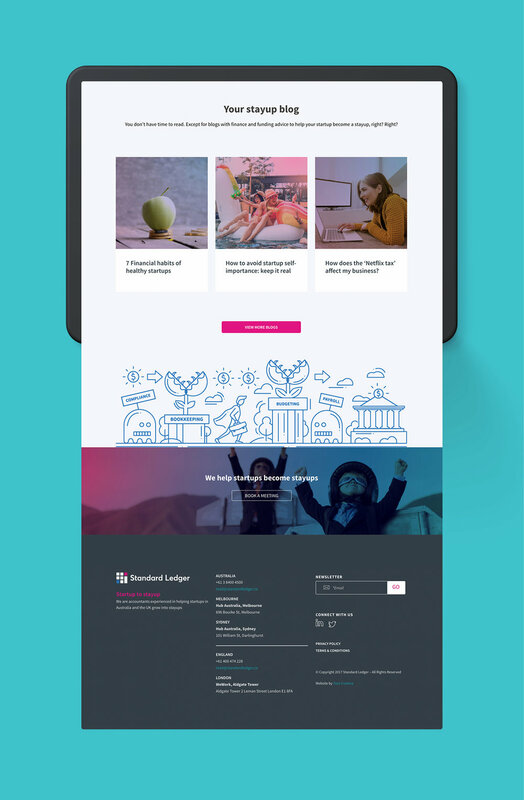 The Standard Ledger team asked us to help them extend their brand refresh across their website. They wanted their website to look and sound exciting – with high-quality content designed to generate new sales leads. Tout Creative reviewed Standard Ledger’s existing site to identify the key lead-generating pages for search-engine and conversion-rate optimisation. Our website analytics review identified the most-visited pages, and highlighted that desktop and mobile optimisation would be a key design driver. 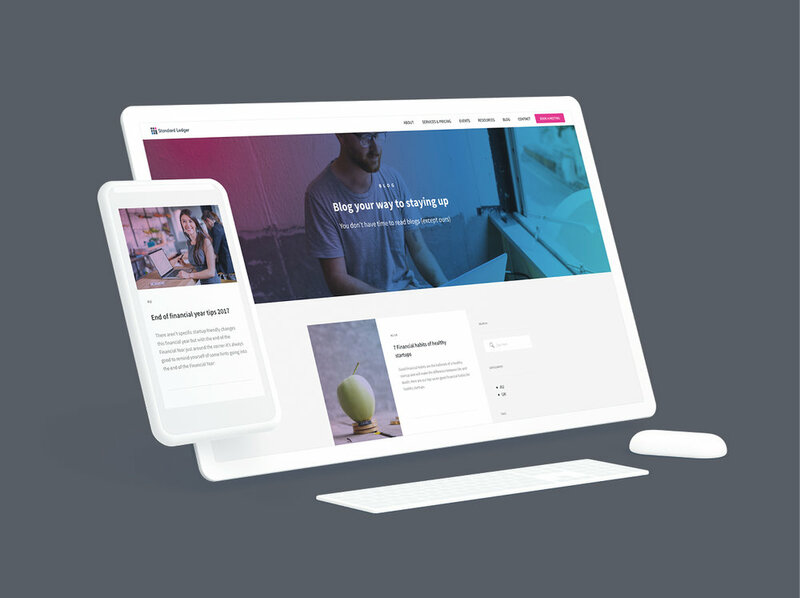 Standard Ledger wanted a wide range of function-rich web pages requiring custom plug-ins, tabs, and pages offering tailored content for UK and Australian audiences. For Tout, the challenge was to ensure the many web elements would meet the client’s functionality requirements – and would successfully cater to two audiences. Ensuring the new Standard Ledger branding was incorporated into the design was also key to the success of this project. The new Standard Ledger website is bright, welcoming and professional, with a range of user-experience-optimised features. Prospective clients can book a meeting from the homepage, or contact Standard Ledger from any page on the site via the call-to- action above the footer. The Standard Ledger newsletter sign-up is also easy to access via the footer. The site navigation is beautifully clear, supported by icons acting as visual aids throughout. For Australian and UK audiences, the site has been colour coded as a strong visual navigation aid.